Healthy and quick cheese and vegetable tortellini soup with garlic, tomatoes, chard and eggplant. A hearty and delicious way to stretch a bag of bought tortellini. Top with extra parmesan to really take your soup up a level. Most of us have a bag of tortellini as an emergency meal option. Filled pasta is a perfect fix for those times when you come in the door absolutely starving, but with zero energy to prepare dinner for you and your family. Typically we boil a big pan of water, throw in the pasta, drain it and then top with some pesto and cheese. And there is nothing – nothing at all – wrong with this option. An easily thrown together dinner of tortellini has circumvented many a “hangry” moment in my home. “The comfort of carbs” is my not very original phrase for this kind of meal. Another thing we sometimes have on hand is a big carton of soup. Or perhaps we have homemade soup in the freezer. Prepared soup is always a winner for a quick meal. I’ve got loads of soups here on Food To Glow that I rotate between, stashing extras in the freezer for a day when I have no inspiration or energy. Yep, it happens to us food bloggers, too! But what about combining these essential, quick hunger busters into one rather gorgeous meal? With added vegetables and a little chilli and cheese for an added yum factor? Oh my days, it really is dinner magic. Imagine little pillows of pasta bobbing around in a simple, hot, tomatoey broth with added vegetables for flavour, satiety and, of course, nutrition. Well, keep that delectable image in mind as I walk you through the basics. And then be prepared for an overwhelming desire to make this immediately. Cube and Steam Chop the eggplant into bite-size cubes and steam them until just done. You can sauté these of course, but I tend to steam them and save the added extra virgin ollve oil for drizzling on top of the soup – where we can fully appreciate it’s silky, grassy flavour. Chop and Sauté While the aubergine is steaming, you finely chop the onion, mince the garlic, chop the mushrooms, cut the courgette into small cubes and ribbon-slice the chard or spinach – chopping the tender chard ribs, too. I don’t bother to cook the stems longer in this kind of recipe, where everything is submerged in liquid. Sauté and Simmer Then it is simple matter of sautéing the vegetables, adding the tomatoes, dried herbs, tomato paste and water. This is what makes up the fragrant , nutritious broth. Easy, huh? Once the vegetables are nearly cooked slip in the tortellini, optional chilli flakes, fresh herbs and serve hot with grated hard Italian cheese. Change out the chard for spinach, kale or even broccoli. I would definitely always include a leafy green to balance the flavours and add a different texture. Use any vegetables that you love or need to use up. Of course it might not be eggplant parmesan-esque, but I’m sure it will be damn tasty. Just make sure to cut the vegetables to a similar size. And give the denser, harder ones a head start with the onion base. A bag of mixed frozen vegetables – especially an Italian or Med mix – would be great, too. Add more protein. Borlotti beans would be a particularly good choice. Or maybe add shredded cooked chicken or prepared shrimp. Maybe add a spoon of pesto instead of the sun-dried tomato paste. No tortellini? Just add some leftover cooked pasta. This would make a lighter soup, probably more suitable as a starter or as part of a larger meal. Make some quick croutons for added texture (I’m big on texture). I like to break up a stale piece of my sourdough bread into smallish, ragged pieces. Then I fry them in a small amount of garlic olive oil with fresh or dried herbs and a few grinds of pepper. Drain on kitchen paper. I love using Rana brand Aubergine Parmesan Tortelloni (yes, an “o”), but any vegetable or vegetable and cheese filled pasta shape will work. Gluten-free would, too. The great thing about adding any quality type of tortellini to a broth is that it adds a silky, starchy “mouthfeel”, especially if it sits for a wee bit. I know you can add cream to this kind of soup to boost the specialness of the simple ingredients, but I really think it is luxurious-tasting without. But let me know if you add a touch of cream or the vegan equivalent. Why wait until a busy night to give this yummy marriage of tortellini and soup a try! It’s a gorgeous little idea of a recipe to try any day. **Remember to follow me on Pinterest and, if you make my Eggplant Parmesan Tortellini Soup, click on the pin below the recipe card and leave a photo of your make with a comment telling me what you think, or any awesome changes that you made. Like this kind of recipe? Why not try my recent Shiitake-Ginger Broth with Gyoza Dumplings? Shiitake-Ginger Broth with Gyoza Dumplings – easy and delicious! 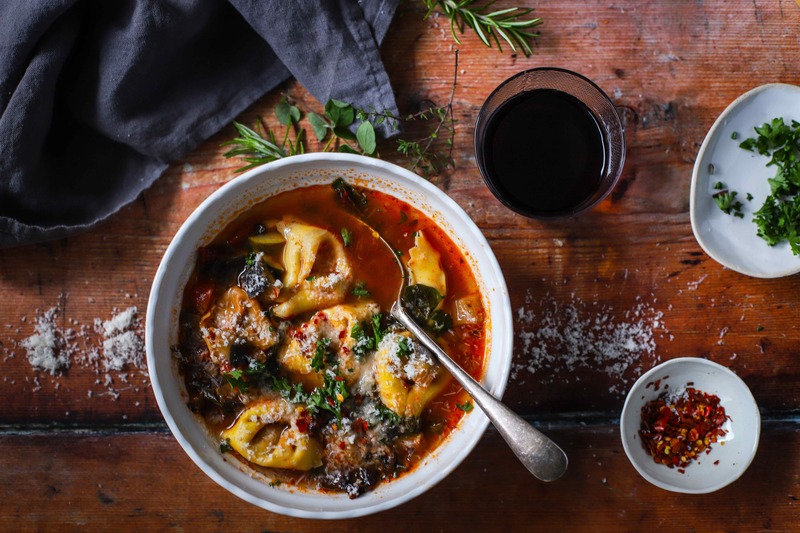 Healthy and quick tortellini soup with garlic, tomatoes, chard and eggplant. A hearty and delicious way to stretch a bag of bought tortellini. Chop the aubergine/eggplant into small-ish cubes. Steam them for eight minutes. Set aside with the lid off. While the aubergine is steaming, finely chop the onion, mince the garlic, chop the mushrooms, cut the courgette into small cubes and ribbon-slice the chard or spinach - chopping the tender chard ribs, too. Heat the oil in a large pan over a medium heat. Add the onion and saute, stirring, for five minutes. Add the rest of the vegetables and turn to coat. Saute, stirring for five minutes. While the vegetables are cooking, boil 1.2 litres of water. After the vegetables have softened, add the steamed aubergine cubes, tomatoes with their juices, mixed herbs, sun-dried tomato paste and the boiling water. Bring to the boil. When the soup has come up to the boil, add the tortellini and cook for three minutes. Stir in any fresh chopped herbs and chilli flakes and let sit off the boil for one minute. Serve warm with grated cheese and more olive oil. Nutrition calculation based on average, purchased, vegetable filled tortellini and doesn't include optional grated cheese and additional olive oil. I use Rana Aubergine Parmigiana Tortelloni for this recipe. Other, similar products would work just as well, I'm sure. Feel free to sauté the aubergine, but I find that steaming it is perfectly fine for this kind of recipe. Use whatever vegetables that compliment your tortellini, or that you like! Although I use water, do use a light vegetable broth if this better suits your palate. Make it even heartier - although we find this version very hearty - by adding some cooked beans, such as borlotti when you add the water and tomatoes. Clever clever. Love it ! What a gorgeous soup. You certainly have a way of making rich, comforting dishes in a simple, balanced yet still inspired manner. I recently made Heidi’s curried tortellini red lentil soup, also really good. But I love all the veggies and the Italian spin here. Ever since you mentioned the idea of a soup like this I thought it was genius. A simple yet effective way of vamping up pasta and making it hearty and elegant! Will definitely be on my student menu soon!